Many homeowners who are unsatisfied with the style of their bathroom still have the same fixtures which were installed when the house was built. Before ripping out the entire room to renovate it, consider a change of lighting first. You may be surprised by how much of a difference proper lighting can have in making your bathroom relaxing, cozy, and inviting. Are there shadows or dark areas? Is there ample lighting at the mirror? Does the bathtub or shower have enough lighting? Do you need task lighting or ambient lighting? Once you have established what kind of lighting you need, choose the fixtures by taking cues from the style of your bathroom and décor of your home. Modern fixtures with minimal detailing and sleek profiles often look great with designer tile or natural stone wall treatments, flooring, and countertops. This will create an elegant, refined, and minimalist look that is suitable for modern space. Traditional bathrooms on the other hand are best suited to intricate wood detailing, classic natural features, and elegant traditional features. The warm tones and natural wood in this bathroom are perfectly complemented by the mirror-mounted rustic lamps made of frosted glass and brushed metal. Evoking a cottagey and comfy atmosphere, this space demonstrates a love and respect for nature and comfort. 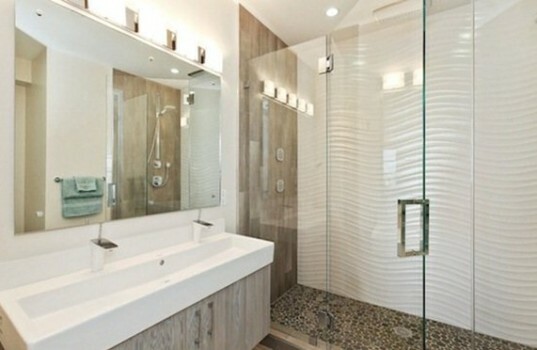 This predominantly white bathroom features a great variety of reflective textures including the glossy shower tile and sink as well as the large mirror and glass shower door. In order to make the most of these modern elements, strips of lighting illuminate both the vanity and shower with clean lines. 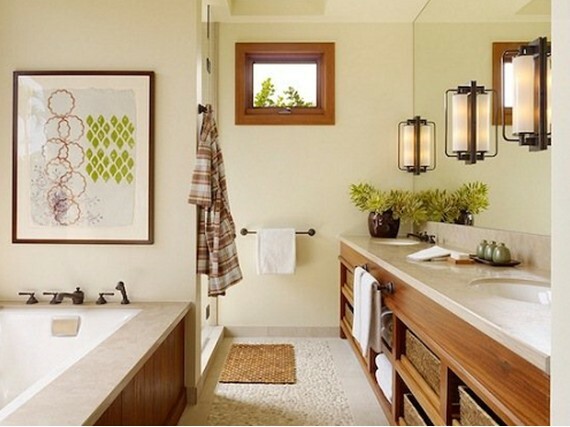 This elegant bathroom makes great use of contrast between colors as well as natural and manmade materials. The large black-framed mirror and black countertops ground the otherwise light room and the dark accent wall in the shower ties it all together. The charming pendant light hung by the vanity provide excellent lighting as well as adding a touch of class and interest to the room.